I made this yesterday after church! I'm not really a quilter, and I wouldn't really call myself a seamstress... More like a seamstrocity. But I've made a couple of projects like this and they turn out very well. I used some vintage cotton prints from my stash, then felt and fleece scraps for the birds. The back is not vintage, but one of the prints I bought at the fabric store on Saturday. I thought about sewing the pillowform INSIDE of the pillowcase, but then decided against it and made this little envelopey opening for easy washing. I totally forgot to shrink the back fabric first, soooo looks like this will not be going in the dryer. 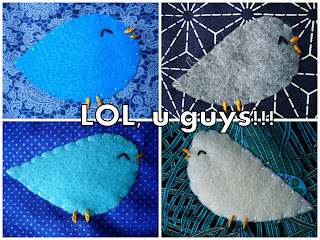 These are my favorite laughing birds I handstitched. I like how they all have different faces. Haha, upper right-corner-bird is SO AZN! !